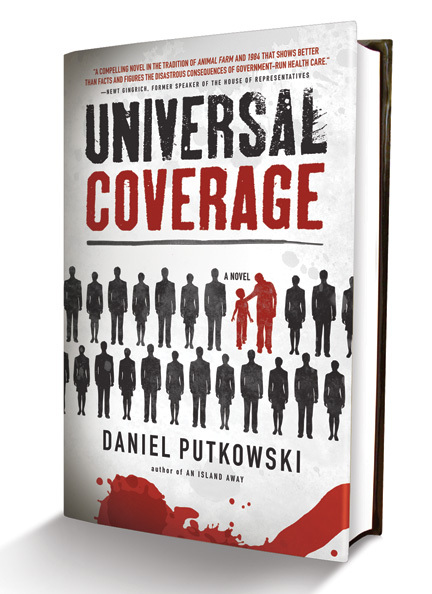 As the title implies, Universal Coverage is my novel about healthcare. To read the first chapter, follow this link to my website: http://www.danielputkowski.com/books.html. Bob Smith had it all. A beautiful house, a happy family, a rewarding career, and a government concerned with his well-being. But when his young son collapses, everything begins to crumble. Suddenly thrust into the world of Universal Coverage, Smith discovers that the ideals he voted for have spiraled out of control. The U.S. nationalized healthcare system has quickly devolved into a nightmare of unbearable waits, inevitable fraud, and uncertain outcomes presided over by a disinterested bureaucratic class. ….As Smith struggles to save his son’s life, he finds the only hope is Salvare, an unauthorized hospital ship providing world-class care to anyone with cash who’s willing to make the journey. A miracle at sea awaits aboard Salvare if Smith is brave enough to question the dangerous path his country has taken. Time is running out, and in matters of life and death, timing is everything. Think about it and what it means to you if or when the government controls healthcare.